While Kimmie Rhodes does appear to have been around ‘forever’ it’s staggering to find she actually recorded her first album in 1981 – 34 years ago! In that time she’s managed to do what the majority of her contempories have failed to; writing songs for Willie, Waylon and even Rock guitarist extraordinaire, Peter Frampton but also releasing 15 albums that are the spine of many Country and Americana record collections. On this, her 16th album Kimmie has gone back to roots in some ways to produce an album of songs that have 60’s and 70’s Classic Country groove top them while still managing to sound very contemporary. This is the type of music you dream of stumbling on in a Nashville or Austin bar on a quiet night; with songs like Always Never Leave and Will you having a dream like quality I’ve not heard since Nanci Griffith’s early recordings. Kimmie definitely goes back to her teenage years with Don’t Leave Me This Way, which really tugs at the heartstrings in a way that only Classic Country songs can produce and; as usual Rhode’s uses her ‘Sunbird house band’ throughout, and sound like the cream of Austin’s players and pickers; including Johnny Goudie who duets on the beautiful love song I Am Falling, which opens the album and later Having You Around. A word of praise must also go to the Producer, Gabriel Rhodes who just happens to be Kimmie’s son; and he’s done a wonderful job bring out the very best in his Mothers words and voice. 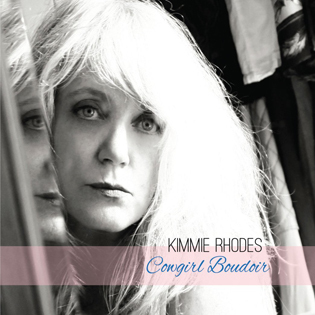 It’s quite funny and more than a little bit ironic that a singer-songwriter of Kimmie Rhodes ‘experience’ is such breath of fresh air in this over produced and over hyped industry; but that is exactly how COWGIRL BOUDOIR comes across.